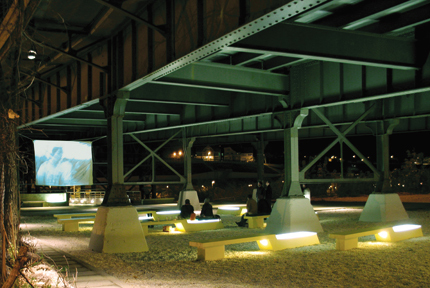 The Media Garden in Milwaukee turns a formerly underutilized area under a viaduct into a community performance space. The 2008 Levy House, for example. A private residence just outside of Milwaukee, the house is located on one of the steep ravines that drain water into Lake Michigan. La Dallman responded to the site with a striking massing in which a second-story bedroom is cantilevered out over the first- floor living room. “The idea of the massing was to thrust oneself toward that view as much as possible,” La said. Since the first story is made up largely of (non-load-bearing) glass to maximize views, the architects employed a structural post-tension concrete system to support the entire second floor on a single column in the living room. 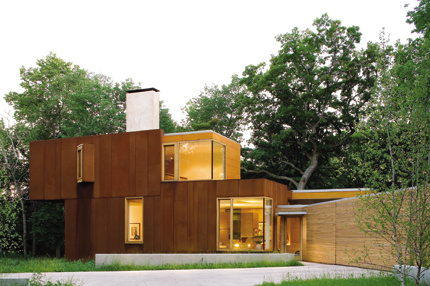 A custom-designed Corten steel cladding shows off the natural coloration of rust, blending the house into its surroundings and giving the lake vistas top billing. The Levy House outside of Milwaukee is perched on the edge of a steep ravine, with stacked massing that thrusts it toward expansive views. Milwaukee’s particular urban conditions have also proven fertile ground for inspiration. “We discovered there are a lot of underutilized, leftover spaces that can really be given a new life,” La said. One that piqued their attention was a 700-foot-long steel viaduct which had been constructed in 1925 to support trolley cars passing over the Milwaukee River, and which now carries cars traveling at highway speeds. “We thought if we could make a pedestrian connection across this river, all sorts of things might be able to happen—like renewed retail and commercial activity on both sides, or possibilities for alternative transportation,” the architect said. Working with a community group, they won grants to develop a plan for a footbridge hanging from the cathedral-like underside of the viaduct, which earned the nickname “Marsupial Bridge” for the way it resembles a marsupial baby clinging to its mother’s belly. The footbridge terminates in a public space outfitted with internally-lit, concrete-and-acrylic benches, where local groups have started holding film festivals and beer gardens. Without an indication on any map of its existence, the footbridge has nevertheless begun to attract a groundswell of public attention and was recently voted one of the hippest spots in Milwaukee. “We knew we had made it into the consciousness of Milwaukee when we started to see it on the album covers of local bands,” La said.